The era in which Ibn Baṭṭūṭa traveled to the East was exciting but turbulent, cursed by the Black Plague and the fall of mighty dynasties. His chronicle provides a first-hand account of increased globalization due to the rise of Islam, as well as the relationship between the Western world and India and China in the 14th century. Readers are given insight into the complex power dynamics of the time as well a personal glimpse of the author’s life as he sought to survive them, always staying on the move. The Riḥla is of great value as a historical document and for its religious commentary, especially regarding the marvels and miracles that Ibn Baṭṭūṭa encountered. It is also an entertaining narrative with a wealth of anecdotes, often humorous or shocking, and in many cases touchingly human. The book records the journey of Ibn Baṭṭūṭa, a Moroccan jurist who travels to the East, operating at high levels of government within the vibrant Muslim network of India and China in the 14th century. It offers fascinating details about the cultures and dynamics of that region, and a dazzling narrative that goes well beyond the standard travelogue. Tragedies and wonders fill its pages, shared for the greater glory of Allah and the edification of readers both past and present. The late Noël King, University of California, was the author and editor of numerous books, including Ibn Battuta in Black Africa. Albion M. Butters, University of Turku, is the editor of Studia Orientalia Electronica. Born in Rawalpindi, Prof. Noël Q. King (1922–2009) was educated at Oxford and the University of Nottingham. He established Religious Studies programs in Ghana and Uganda before moving to UC Santa Cruz in 1967. As a historian and scholar of religion, his publications range in focus from early Christianity to African religions, and from Islam to Sikhism. 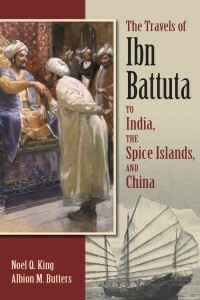 A great love and appreciation of Ibn Battuta dated back to his childhood, when his father told him stories about the Moroccan traveler’s journeys and spurred his desire to conduct extensive research, publish Ibn Battuta in Black Africa with Said Hamdun in 1975 an expanded edition in 2003for the 700th anniversary of Ibn Battuta’s birth, and complete this present work in retirement. Noël King traveled in Ibn Battuta’s footsteps, making pilgrimages to the very places described here. In this inimitable translation, they come alive. Dr. Albion M. Butters first met Prof. King in 1985 as a student at UCSC, taking a class in Comparative Religion that would lead to a career in that field. He received a Ph.D. in 2006 from Columbia University in the History of Religion with specialization on the 14th-century Tibetan scholar and saint Klong-chen Rab-’byams-pa, as well as the literary genre of Buddhist doxography, for which he translated The Precious Treasury of Spiritual Systems (Grub mtha’ mdzod). Since then, his interests have expanded to include Cultural Studies and American Studies. In editing this book, he had the immense pleasure of working with his mentor and turning his attention once again to medieval Asia. Albion M. Butters teaches at University of Turku, Finland, and is the editor of Studia Orientalia Electronica.